There are moments in the life of a man where he clearly needs a Gin. Just kidding! 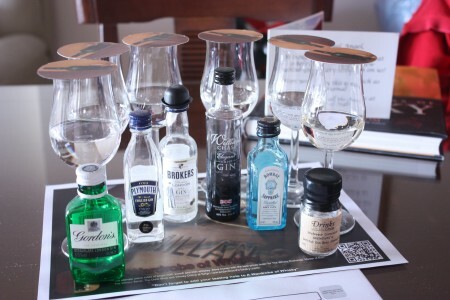 If eventually that moment arrives your can be sure that your mind is already beyond hope… but nevermind… I decided to taste a few Gins for Science’s sake. The chaps at Master of Malt sent a sample of their new Bathtub Gin at Navy Strength ( Myth Busters like video included at the end of the article by the way! ) so I introduced my hand on the “other drinks” box and grabbed five more gins… there is no worse thing in this world that just having a only a single dram. I have had these miniatures around for months and never find time to properly taste ( or dispose! ) them so this is a great time to measure what this crazy Professor Ampleforth has achieved with this Gin. Although it wasn’t my favorite style of Gin previous 43% version of Bathtub was quite nice, for a Gin I mean. I still prefer a good measure of a young peated whisky for medicinal purposes! 70cl / 37.5% - The behemoth of the industry needs no introduction, surely? Gordon's gin is one of the top ten-selling spirits in the world, and has been made to the same recipe since the late 18th Century. Palate (77): powerful. juniper, citrus, sweet, grass. So based on other whiskies I have already tasted I rate this Gordon's Gin with 75 points over 100. Palate (76): light. juniper, citrus, floral, sweet, herbs. So based on other whiskies I have already tasted I rate this Plymouth Gin with 74 points over 100. 70cl / 40% - A delicious lip-smacking gin at a great price. Clean, fresh and a step up in quality from run-of-the-mill juniper concoctions. Nose (75): average. juniper, floral, citrus. Palate (79): powerful, oily. juniper, sweet, citrus, floral. Finish (77): average. juniper, citrus. So based on other whiskies I have already tasted I rate this Broker's Gin with 77 points over 100. 70cl / 48% - A deliciously tasty gin from the highly innovative Williams Chase distillery in Herefordshire. Not content with knocking out the delightful Chase potato vodka, they've now bottled this wonderfully fresh (and pleasantly potent) gin, distilled from their own organically grown apples. Bravo! Palate (80): powerful. juniper, herbs, citrus, sweet, pepper. So based on other whiskies I have already tasted I rate this Williams Chase Elegant Crisp Gin with 79 points over 100. Nose (73): weak. citrus, floral, juniper. Palate (77): powerful. juniper, citrus, sweet, floral. Finish (75): average. juniper, floral. So based on other whiskies I have already tasted I rate this Bombay Sapphire Gin with 75 points over 100. This is the Navy-Strength edition of the famous Bathtub Gin from Professor Cornelius Ampleforth. As well as boasting a higher ABV than the original Bathtub Gin, this edition also has a bigger botanical punch thanks to the 'bashing up' (technical term) of said the botanicals to release more flavour. Nose (82): more than average. juniper, citrus, floral, orange zest. Palate (85): powerful, oily. juniper, sweet, citrus, fruits, floral. Finish (83): longer than average. juniper, honey, citrus. So based on other whiskies I have already tasted I rate this Bathtub Gin Navy-Strength with 83 points over 100. Hell! That wasn’t as bad as I was expecting. In fact I have really enjoyed two Gins: Williams Chase one and Bathtub Gin. The extra 15% of alcohol on Bathtub really does the work in its lovely powerful clean juniper and citric notes. The normal version or the Navy Strength one? If you don’t have shaky hands go and grab the navy strength version. It is more “defined” than the other, just handle it with care.